Amazon and Barnes & Noble. Signed copies are available from the author. The post below was inspired by the research I did for the book, using primary sources whenever possible. For more about this and other works of mine, see below following the post. Every writer who gets published learns quickly the joys and horrors of exposure, when reviews begin to come in. Here are two LibraryThing pre-publication reviews of my novel Dark Knowledge, showing the difference in readers’ reactions to the same work. The first is a one-star review, the worst that any work of mine has ever received; the second is one of several four-star reviews. Ratings range from one star, the worst, to five stars, the best; four stars is very good, but not quite a rave. To give five stars, the reviewer has to be vaulted into realms of unmitigated bliss. By the mid-nineteenth century the port of New York was the busiest in the hemisphere, doing trade with all the major ports in the world. That New York City was also the center of the illegal slave trade in the 1850s may surprise many today, but such was the case. Respectable citizens were hardly aware of the trade, but those on the waterfront, even if uninvolved, could see signs of it. Any vessel bound for Africa was suspect. During eighteen months of the years 1859-60, eighty-five slavers were reported to have been fitted out in New York harbor, transporting from 30,000 to 60,000 slaves annually. This post will have a look at that trade, drawing mostly on primary sources. could outrun British cruisers were preferred. In June of 1860 – on the very eve of the Civil War – a young New Englander named Edward Manning, being short of cash, went to a New York City shipping office and signed up for three years on the Thomas Watson, a whaler being fitted out in New London, Connecticut. Going to New London, he found a smart-looking vessel of 400 tons, remarkably clean for a whaler, many of whose crew were, like himself, “greenies.” A fine-looking woman came aboard and conferred with the captain in his cabin; she was said to be one of the owners. Had he not been a greenhorn, young Manning might have wondered why the ship was taking on so much rice, hard tack, beef, pork, casks of fresh water, and other supplies – far more than was needed for the crew of a whaler – as well as quantities of pine flooring that would be laid over the stores in the hold so as to create a new deck. He might also have wondered why the ship couldn’t get clearance and sail from New London, but instead went down to New York, accompanied all the way by a U.S. revenue cutter, all of which suggested that the ship was somehow suspect and might have a history. In New York the Thomas Watson anchored briefly off the Battery, then caught a favorable breeze and sailed from there, presumably bound for waters rich in whales. As the vessel crossed the North Atlantic, it proved to be a smart sailer, hard to overtake. Nearing the presumed whaling grounds, the captain posted a lookout aloft to look out for “blows,” and even sent out boats in quest of whales, sustaining the image of a whaler all the way to the coast of Africa. Approaching that coast, it sighted a British man-of-war, at which point the “old man,” as the crew referred to the skipper, ordered the men to remove the pine flooring and store it aft. As the warship approached, it fired a shot across the whaler’s bow, raising a splash. “What ship is that?” came the query. “The Thomas Watson.” “I’ll board you!” So spoke the greatest navy in the world, displaying the arrogance typical of a world power. By now the greenies had long since grasped the fact – not particularly dismaying to most of them – that the Thomas Watson was no whaler but a slaver in disguise, hoping now to outwit the British Navy, which was intent on suppressing the slave trade, illegal in most parts of the world. A gig came alongside, and the English commander boarded the vessel, conferred with the captain in his cabin, and then inspected the deck and hold. Though he found no overt signs of a slaver, he was frankly skeptical and promised to have a look at the vessel again in the future. Once the departing visitors were out of earshot, the captain, an irascible man, exclaimed, “You English sucker! You’ll see me again, will you? I’ll show you!” In point of fact, they never encountered the warship again. HMS Black Joke firing on the Spanish slaver El Almirante. The British ship freed 466 slaves. If the greenies had any reservations about serving on a slaver, they had little choice, being far from home and near the coast of Africa. Enhancing their resignation may have been the realization that no trade on the seas was more lucrative than this one, which might mean more pay at the end of the run, if the British Navy -- and the American, though it was typically less in evidence – could be eluded. In 1860 the trade still flourished, taking slaves from West Africa to Cuba, then a Spanish colony, where the authorities looked the other way while the planters acquired more labor for their sugar plantations and paid well for it. Of the whole crew, only Manning voiced objections to serving on a slaver, for which he earned the captain’s undying enmity. As the Thomas Watson neared the African shore, a small boat with naked black rowers approached, waving a bright red rag. A Spaniard came on board, embraced the captain, and kissed him. They conferred, then the Spaniard departed, leaving the crew mystified as to what this was all about. The Spaniard was allegedly a palm oil merchant, but the mystery remained. They now made contact with a schooner, and the palm oil merchant reappeared, boarded the ship, and gave the captain another affectionate kiss. The pine flooring was now quickly laid, creating a deck to receive the oncoming cargo. Naked blacks – men, women, and children – now issued from the shed and walked in single file to the beach, where their black guards began tossing them into a surf boat that then negotiated the surf safely and transferred its human cargo to a small boat from the ship. The slaves were then taken to the ship and piled into the hold, the women separately in steerage. The ship was rolling all this while, so the slaves were seasick, and the foul air and great heat made the hold unbearable. Five or six were dead by morning, and their bodies were tossed overboard. Having secured its cargo, the Thomas Watson immediately weighed anchor and got under way, carrying some eight hundred blacks of all sizes and ages, with the Spanish captain and a crew of eighteen whites. The Spaniard, a veteran of the trade, was now in charge, whip in hand, and his ferocious manner kept the slaves in check. Guarded by overbearing guards of their own race, whom Manning identified as Kroomen (an African people living in Liberia and the Ivory Coast), the slaves were brought up on deck and fed rice and sea biscuits, but the stench below was suffocating, until means were found to let air in for ventilation. The Spaniard was a man of moods and contradictions. He delighted to let the little girls come up and play on deck, but when a man was caught stealing water, he had him flogged unmercifully. And yet, having some knowledge of medicine, he improvised a hospital on deck and treated those who were ill, probably saving the lives of several. Dysentery was the commonest ailment, but there were two fatal cases of smallpox, one of scurvy and one of palsy. Also, one woman gave birth to twins, but both infants died. Slaves on deck, being shackled. The long transatlantic trip was not pleasant even for the whites on board. Scared out of the hold, the ship’s rats invaded the forecastle, where the crew slept. Manning tells how one night he felt sharp claws on his face, and a rat gnawing at his big toe, whose toenail was almost gone; after that he slept on the deck. When a crewman died of a fever in the dark, dingy hole of the forecastle, he was sewed up in canvas and laid out on a plank on deck; then, with no attempt at a service, the plank was raised at one end, and the body slid into the sea. Meanwhile the American captain was getting drunk daily on rum and then retiring to a spare boat on the poop deck to sleep it off. The Spanish captain remonstrated with him, protesting that he was setting a bad example for the crew, but to no avail. The condition of the slaves was now of some consequence, as the vessel was approaching Cuba. They were brought up on deck in batches, and bathed in the spray from a hose. To fumigate the hold, the crew stuck red-hot irons into tin pots filled with tar, sealed the hold with hatches, and waited two hours; by then the hold was considered cleansed. Having been at sea for six months, the crew were now eager to make land. The likable second mate expressed the hope that he would make enough money on this voyage to buy a little place ashore and settle down; for him, it was just a job. They now scraped the ship’s name off the stern, thus making them all outlaws, and the vessel fair game for anyone. Special precautions had to be taken, for British men-of-war patrolled the Cuban coast as well, and the appearance there of a whaler would arouse suspicion, especially if large numbers of blacks were seen on deck. In time they rendezvoused successfully with two schooners, one of which came alongside; brought up to the deck, the blacks were made to jump down to the schooner’s deck, the Kroomen going last. The Spanish captain too left the ship, and the second schooner took on half the blacks from the first one, after which the two schooners made for land. Their cargo delivered, the crew of the Thomas Watson then removed the telltale pine flooring and threw it overboard. The ship now sailed to Campeche, Yucatan. Chloride of lime was sprinkled in the hold to eliminate the smell of slaves in confinement, but some hint of the odor remained. The crew were now paid, and paid well, in Spanish doubloons, and Edward Manning took passage on a Mexican schooner to New Orleans, where he arrived in January 1861. There, finding Secession in the air and the people feverish, the New Englander got out fast, returning to New York by rail. When war broke out, he joined the U.S. Navy and served for the duration. The Thomas Watson became a Confederate blockade runner but while pursued by Northern warships it ran aground on a reef off Charleston, South Carolina, and was burned by the Northern ships to the water’s edge. Such was the account of Edward Manning, which he published with the title Six Months on a Slaver in 1879. Though opposed to slavery, he tells his story in a sober, matter-of-fact way, expressing sympathy for the slaves, but never inveighing against the evils of slavery. In short, he lets the story tell itself. The book is a rare example of a firsthand account of the trade, since those involved usually shunned publicity. The voyage was routine, with no drama: no pursuit by British cruisers, no slave revolt, no storm, no high death rate among the slaves. The vessel’s prompt departure from the port of New York, which Manning doesn’t explain, was probably facilitated by prior negotiations with the authorities there and smoothed with a bribe. Manning doesn’t identify the coast where the slaves were taken on, but it was certainly that part of West Africa where the Atlantic trade flourished: the Ivory Coast, the Gold Coast (modern Ghana), and the Slave Coast, this last being the coastal area of modern-day Togo, Benin, and western Nigeria. The first meeting with the palm oil merchant, later identified as the Spanish captain, was to arrange a rendezvous for loading the slaves; this was to make sure that the loading would go quickly, so the vessel could get away fast from the coast without being caught by a British warship. The Spaniard was evidently a loose packer, meaning that he allowed the slaves ample room and thus kept mortalities to a minimum; tight packers usually had corpses to dispose of, and the corpses, once in the sea, drew sharks that might follow the ship for days: the sure sign of a slaver to the captain of a British cruiser. But in the vast expanse of the North Atlantic, there was little risk of detection, until the slaver approached the Cuban coast. The Kroomen guards were probably not destined for slavery, but further employment by the Spaniard on future voyages, it being a sad fact that blacks too participated in the trade and facilitated it. “The Slave Trade in New York,” a January 1862 article in The Continental Monthly, a new periodical of the time published in New York and Boston, gives useful background for Manning’s story. Since by then reform was under way, the conditions described are those prevailing before the 1860 election: exactly the time when Manning was recruited for the Thomas Watson. According to the article, New York City was the world’s leading port for the slave trade, with Portland and Boston next. (The author might have added New Orleans.) Slave dealers, some of them seemingly respectable Knickerbockers, contributed liberally to political organizations and thus influenced elections not only in New York but also in New Jersey, Pennsylvania, and Connecticut. The captains involved in the trade lived in residences and boardinghouses in the eastern wards of the city and formed a secret fraternity with signs, grips, and passwords. A slave captain planning a voyage would initiate preparations in a first-class hotel like the Astor House, where the risk of detection was less than in a private office. Runners, provided with the names of men of every nationality who had served on slavers before, would be sent to boardinghouses to recruit a crew; their appraisal of prospective crewmen was reliable, their blunders few. Rather than equipment for a whaling voyage, as in the case of the Thomas Watson, apparatus for refining pine oil, a common and legitimate import from Africa, was often used as a blind, for a U.S. marshal would inspect in port any vessel suspected of being a slaver. One yacht owner was quoted as saying that he had paid $10,000 to get clearance. But getting clearance at the custom house was easy, a transparent disguise being enough. And should a slaver be captured by a British warship, the New York owners were rarely troubled, having a corps of attorneys on retainer to defend them. As an example of the laxity of the law, the article tells the story of the brig Cora, a slaver captured at sea and brought to New York. Her skipper, Captain Latham, was lodged in the Eldridge Street Jail, where inmates caroused freely with liquor and champagne. Securing funds from a Wall Street connection, Latham bribed one of the U.S. marshal’s assistants with $3,000 and so was allowed to leave the premises, buy a suit at Brooks Brothers, and proceed to the dock just in time to catch a steamer to Havana. Since then Latham was said to have returned to the city in disguise. Not all slave voyages were as routine and uneventful as that of the Thomas Watson. Edward Manning never got ashore to see a caravan of slaves arrive from the interior. 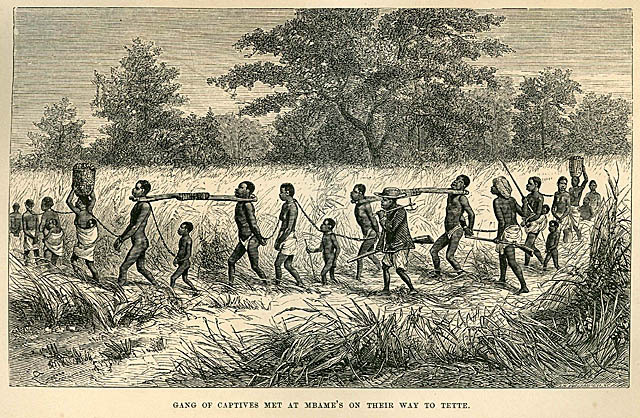 One such caravan of twelve hundred naked slaves, captured and guarded by other blacks, has been described as arriving at the coast to the sound of rifle fire, tom-toms, and drums. The trading that ensued might involve an exchange of slaves, ivory, gold dust, rice, cattle, skins, beeswax, wood, and honey for cotton cloth, gunpowder, rum, tobacco, cheap muskets, and assorted trinkets. A strong, healthy male of twenty might fetch three Spanish dollars; women and boys went for less. And what became of the elderly and sick slaves that no trader wanted? On one occasion eight hundred of them were taken out in canoes by other blacks and sunk with stones about their necks. Here again, the cruelty of blacks on blacks matched that of whites on blacks. The slave trade corrupted all who were involved in it. The worst that could happen at sea was not so much a slave revolt but a fire. One repentant skipper told of such a horror at night, when all their cargo was locked under hatches. The crew tried to put out the fire below with buckets of water, but the flames spread amidships and the vessel was doomed. “Bear away, lads!” ordered the skipper. “Lashings and spars for a raft, my hearties!” The crew improvised a raft from the masts and bowsprit, and hoisted out the two boats, while the fire smoldered between decks and the slaves screamed. As the crew abandoned ship, a merciful mate lifted the hatch gratings and flung down the shackle keys, so the slaves could escape from the hold. As the ship’s two boats towed the raft clear of the burning vessel, the slaves gained the deck, only to become enveloped in flames. Some jumped into the sea and tried to climb aboard the boats and raft; a few succeeded, but the crewmen, fearing that they would be swamped, fought most of them off with handspikes. As the white survivors distanced themselves from the vessel and the drowning slaves, the sea was illumined for miles by the flaming brig. Out of 640 slaves, 115 were saved on the raft. Saved, of course, for slavery. For the traders, not a very satisfactory voyage. And as Edward Manning’s account makes clear, slave trading was an equal opportunity operation. Even in those Victorian times, when ladies were confined to the parlor, with forays into the nursery and outings for good works, some seemingly respectable women were up to their ears in the trade. The woman Manning observed was a New London resident, but there were more such women in New York. They kept a low profile, but occasionally their name crept into print. A Law Intelligence report in the New York Tribune of September 22, 1862, told how a Mrs. Mary Jane Watson of 38 St. Mark’s Place had operated as a blind for John A. Machado, who skippered the bark Mary Francis on a run from Africa to Cuba. Machado was arrested in New York, but to my knowledge no woman was ever prosecuted for participation in the trade. So good Christian men and women – ship owners, ship fitters, insurers, and provisioners, aided by banks extending loans to planters, and by iron merchants providing shackles and manacles – chose to get involved in this shameful web of complicity. Why? Two reasons: money and immunity. A healthy young slave costing $50 in Africa could easily bring $350 or even $500 in Havana, and a healthy but inferior slave at least $250. And the chances of getting caught and prosecuted were minimal. For some, the temptation was simply too great, especially when you could remain at a safe remove and leave the dirty work to others. So it went until Abraham Lincoln was elected president in 1860, and the new Republican administration enforced the law banning the trade and ended it once and for all. 3. Dark Knowledge (Anaphora Literary Press, 2018), the third novel in the Metropolis series. Adult and young adult. A fast-moving historical novel about New York City and the slave trade, with the sights and sounds and smells of the waterfront. Just released; available from Amazon and Barnes & Noble. An English map of the Gold Coast, Slave Coast, and Ivory Coast of West Africa, 1670. Coming soon: As a free sample, the first four chapters of Dark Knowledge. After that, Symbols of Hate: When should an objectionable statue be removed, and when should it stay? And after that, maybe Goldman Sachs again, the vampire squid of Wall Street. 336. Money: Is It Even Real?